OnceLogix birthed the Small Business Cookout out of the need to help minority-owned businesses beat the odds and overcome obstacles to build successful companies. This event is for all business owners that know the importance of learning to become a better leader in business. “At the SBC, we want to lead the effort and build a small business community that will help each business owner and entrepreneur to grow and sustain seven-figure businesses,” said Rod Brown, COO of OnceLogix and creator of the Small Business Cookout. 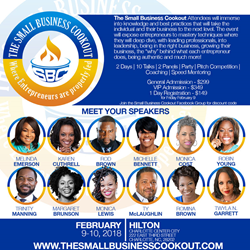 Small business owners and entrepreneurs will have the opportunity during the Small Business Cookout, February 9-10, to participate in "The Moment,” a dynamic speed-mentoring event to help start and grow their small businesses. Margaret A. Brunson, Ph.D., and founder of Illumined Leadership Solutions will facilitate. “The Moment,” is a speed-mentoring experience that involves a series of short, focused conversations about life, leadership and entrepreneurship. The purpose is to match entrepreneurs (protégés) with other experienced entrepreneurs (mentors) willing to provide insightful guidance for their journey. "Collaborating with the Small Business Cookout means that I have a unique opportunity to help entrepreneurs realize their dreams," said Brunson. "I’m excited about facilitating the speed-mentoring event because I know the power of the synergy that happens when people connect with ideas and vision. I eagerly anticipate that a year from now, we’ll hear stories from entrepreneurs about how the “The Moment” speed-mentoring event was a catalyst that propelled their dreams to the next level." The SBC will consist of a two-day experience. Attendees will immerse in knowledge and best practices that will take the individual and their business to the next level. The event will expose entrepreneurs to mastery techniques where they will engage with leading professionals, into leadership, being in the right business, growing their business, the “why” behind what each entrepreneur does, being authentic, and much more! On Friday, guests will join empowering talks that include: “Three Ways to Grow Revenue," “How to be The Authentic CEO,” and “The Emotionally Intelligent CEO.” Also, there will be two panels. The first will be, “The Seven-Figure Sandbox” where attendees can listen to million-dollar conversations from gladiators who have earned over seven-figures, or participate in seven-figure deals. Here, the guests will find out what it takes to play in that sandbox. The second one, “Get Funded” is where attendees will learn about unique ways to finance their business in today’s funding climate. The night will close out with a mix and mingle soiree with music provided by Darryl Little and Friends. Saturday, also coined “Action Saturday,” will highlight the Stand and Deliver Pitch Competition. The competition participants can speak about their business and walk away with money and services. Also on this day, guests can participate in the speed-mentoring event, and early risers can join a mini boot camp, led by an accomplished trainer. This will get their blood stirring and mind ready for the rest of the day. VIP registrants will have the opportunity to receive business coaching from individuals that have started and sustained successful small businesses. OnceLogix, LLC is a nationally recognized award-winning Software Company located in Winston-Salem North Carolina. Over the past 10 years, OnceLogix founders have created several successful, profitable businesses that continue to sustain profitability year after year. In 2016, Inc. magazine ranked our company 3,719th on its 35th annual Inc. 5000 list. The list represents a unique look at the most successful companies within the American economy’s most dynamic segment—independent small businesses. After learning that less than 1.5 percent minority-owned companies were on the list, the founders concluded that they wanted to do something to help with this systemic problem by creating the Small Business Cookout.